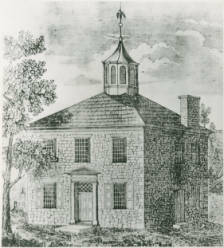 This illustration is of the Ross County courthouse, which became Ohio's first statehouse in 1803. Chillicothe was named the capital of the Northwest Territory in 1800 and became the first capital of the State of Ohio in 1803. Chillicothe was the name of several historic towns in Ohio. The word is from the Shawnee -- a central-North American American Indian in the Algonquian language family. "Chillicothe" was the name of a Shawnee clan. The principal leader of the Shawnee could only come from the Chillicothe clan. When a village was called "Chillicothe", it meant that it was home to the principal leader. It was the capital city of the Shawnee until the death of that person. Then the capital would move to the home village of the next person selected to lead. That village would then become Chillicothe. One Chillicothe was located on the site of the modern city of Piqua. Another was on the Scioto River south of Circleville at, or near, modern-day Westfall. A third Chillicothe was approximately three miles north of Xenia. When the Shawnee captured Simon Kenton in 1778, they brought him to this town. A fourth Chillicothe was at Frankfort along Paint Creek in Ross County. A fifth Chillicothe was at Hopetown, three miles north of present-day Chillicothe. Modern Chillicothe was Ohio's first state capital, but it was never the site of a former Shawnee town. In 1796, Nathaniel Massie laid out the town on the Scioto River. This community grew quickly, becoming a center of political influence within the Northwest Territory. Massie himself chose to settle in Chillicothe, along with other influential men in the territory, such as Thomas Worthington and Edward Tiffin. The town originally consisted of 456 lots. Massie promised to give away one hundred lots to the first settlers. By late 1796, several taverns, stores, and artisan shops had been built. In 1798, Ross County became incorporated with Chillicothe as the county seat. In 1800, the territorial capital moved to Chillicothe, and in 1802 as Ohio moved toward statehood, the city hosted the Ohio Constitutional Convention. Chillicothe became Ohio's first state capital. The reasons why Chillicothe played such an important role in early state government were its central location as well as the prominent men, like Tiffin and Worthington, who resided in the town. The city continued as Ohio's capital until 1810, when state government moved to Zanesville. The capital returned to Chillicothe two years later, only to move to Columbus, forty-five miles to the north, in 1816. During the 1800s, Chillicothe became a busy economic center. While agriculture was the backbone of the local economy, other industries, especially papermaking, contributed to the town's prosperity. In 1831, the Ohio and Erie Canal connected Chillicothe more closely with other parts of the state, expanding the city's markets. Chillicothe entered the railroad age in 1852, when the Marietta and Cincinnati Railroad entered the town. As the railroad acquired new owners, including the Cincinnati, Washington, and Baltimore Railroad Company and the Baltimore and Ohio Railroad Company, Chillicothe residents acquired even more markets for their goods. Usually, railroads quickly drove canal companies out of business. The principal reason for this was that railroads could transfer people and supplies at a much quicker rate and for a cheaper price than the canals. In the case of Chillicothe, however, the railroads and the canal peacefully coexisted. The railroads generally ran from the East to the West, while the canal handled business from the north to the south. The canal remained in operation until 1907, when a flood severely damaged it and forced it to close. World War I contributed immensely to Chillicothe's growth. In 1917, the United States government established Camp Sherman on the outskirts of the city. Within a few months, more than two thousand buildings had been built. They housed soldiers in training for duty in World War I. The city's population swelled from sixteen thousand people to approximately sixty thousand people practically overnight. Today, Camp Sherman does not exist. The United States government still owns the land and has established a Veterans Administration medical center. Three prisons also currently occupy parts of the site, as well as the Mound City National Monument, a National Park dedicated to preserving Hopewell American Indian earthworks. The Hopewell earthworks as well as other historic sites, including First Lady Lucy Hayes's home and Adena, the home of Thomas Worthington, have provided the community with an important tourism industry. Chillicothe businesses continue to produce paper, an industry that had its beginnings in the town in 1810. Chillicothe was the original home of the Mead Corporation, one of the United States' leading paper manufacturers. Daniel Mead established the company in 1890 in the city. During the twentieth century, additional industries moved to Chillicothe. Most importantly was the Kenworth Truck Company, which remains one of the main employers in the community today. Almost twenty-two thousand people called Chillicothe home in 2000. Many people worked in these various industries, while others commuted roughly one hour to Ohio's current capital in Columbus. Che-le-co-the, Glimpses of Yesterday; a Souvenir of the Hundredth Anniversary of the Founding of Chillicothe, Ohio, April 1896. New York, NY: The Knickerbocker Press, 1896. Galloway, William Albert. Old Chillicothe; Shawnee and Pioneer History; Conflicts and Romances in the Northwest Territory. Evansville, IN: Unigraphic, Inc., 1974. Segoe, Ladislas. "Master Plan, Chillicothe, Ohio, and Environs, Prepared for the Projects Committee, Chillicothe Sesquicentennial Commission, July 20, 1948." Chillicothe: N.p., 1949. The Flood of Ninteen Hundred Thirteen, Chillicothe, Ohio: A Short, but Concise History of the Great Catastrophe, Illustrated with Portraits of Some of the Scenes of Destruction. Chillicothe: Hathaway Art Studio, 1913. Webb, Linda Sue. "Chillicothe During the Great Depression." M.A. thesis, The Ohio State University, 1971.